This article is our first in a series on falls, looking at the risks and preventative measures one can take to keep safe at home and outside. What can cause you to have a fall? Advancing age brings with it the increased risk of a fall. It’s a common problem among older people – Age UK reports that approximately a third of people aged over 65 fall each year, with the rate increasing for those over 75. Factors that contribute to falls in the elderly include the common physical effects of ageing such as balance and mobility problems, muscle weakness and impaired vision. Various medical conditions, such as arthritis, and certain types of medication, for instance those that cause dizziness, can also play a part. What are the risks of falling? Injuries resulting from a fall are also more likely to be serious in older people, such as broken bones due to their more fragile nature as people age and, more specifically, hip fractures, which can have a lasting effect on mobility. If the person is unable to get up after the fall and stays on the floor for some time before help arrives there’s also a risk of dehydration and hypothermia. In addition to the physical injury, falling can result in a loss of confidence, anxiety and a reluctance to be active for fear of falling again. In such cases the ultimate effect will be a reduced quality of life and loss of independence. Even so, some elderly people are reluctant to accept fall prevention advice as they feel it isn’t relevant to them, for instance, because they don’t think of themselves as old and frail, or they may consider falling to be an inevitable part of ageing and not something that can be prevented – but it can! Muscle weakness and problems with balance and mobility can be addressed through exercises designed to increase strength and stability. Keeping mobile and active is key, as joints and muscles become stiff when underused and further increase the risk of a fall. In terms of visual impairment, regular vision checks will ensure the correct glasses are worn and potential hazards can be seen more easily and avoided, as will seeking treatment for vision-limiting conditions such as cataracts. Additionally, numerous practical measures can be taken to make the home environment safer. Ensuring there is adequate lighting throughout the home is a priority. Rearranging furniture to allow enough space to pass by and remove barriers in pathways can be very effective. It’s also important to keep all pathways clear of clutter to eliminate trip hazards. Any electrical wires and cables should be tucked away and loose rugs can either be removed or secured with non-slip backing. It’s a good idea to store frequently used items in cupboards or on shelves that are easy to reach without having to stretch or use a stepping stool, which can be a risky manoeuvre. 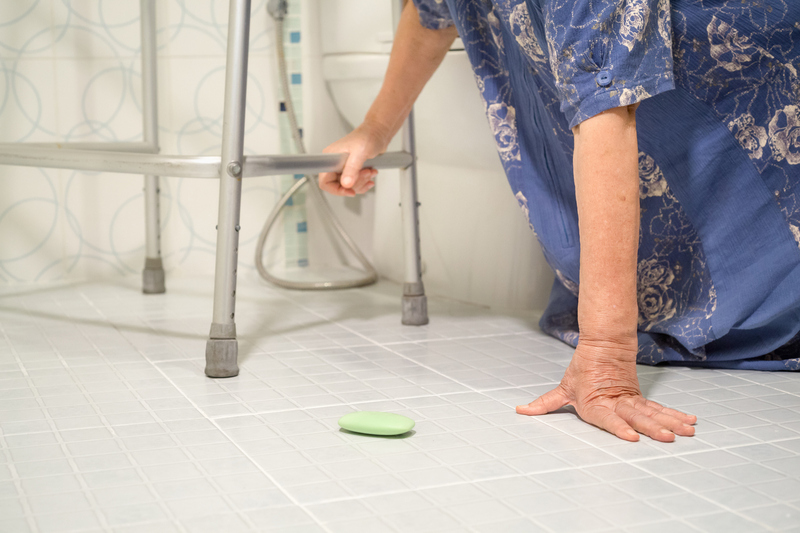 Typical danger zones such as the bath, shower and toilet areas can be made safer by installing grab rails, using non-slip strips or bath mats and perhaps sitting on a stool in the shower. So, while older people are considered more at risk of having a fall, it’s not an inevitable part of ageing as there is much that can be done to minimise that risk and enable them to stay active and continue to enjoy a good quality of life. 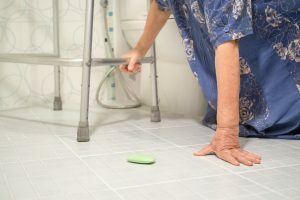 The next article in this series on falls will cover how to get up safely in the event of a fall and advice on overcoming the fear of falling.